Today, we’re going to talk about the introduction of hashtags on Facebook. Okay some people are losing their minds because they think hashtags are going to somehow destroy Facebook. I think they’re great. I’ll give you an example. I was checking out my news feed the other day and one of my friends puts up a post that just says, “Nooooooo!” Nothing else. I had no idea what he was talking about. Was he watching the end of game 6 of the NBA finals? Did his house burn down? I have NO idea. If he would have used a hashtag to put it in context, it might have made more sense. Facebook began rolling out hashtags on June 12th to a limited number of users with a global roll-out expected in the coming weeks. Hashtags make it easier for users to see what others think about trending topics. We’ve seen hashtags carry over from Twitter users on Facebook for some time. The difference now is the they’ll be both searchable and clickable. The adoption of hashtags will probably decrease the need to abandon Facebook for Twitter when there’s a hot trending topic. Clicking on a hashtag will open a new page displaying conversations containing that particular hashtag. Facebook has always been a CLOSED network, meaning you can only see your friends’ posts and, depending on privacy settings, comments friends of friends make. However, the new hashtag feature will allow you to find and connect with others using the hashtag you’re searching for. You will still be able to adjust your privacy settings to CONTROL the audience for your posts, including those containing hashtags. The first posts you’ll see will be those from your friend network followed by public results from individuals and pages. If you have a brand with a Facebook presence, you don’t have to worry about creating hashtag pages. Facebook will crawl the site to determine the links and create them automatically. 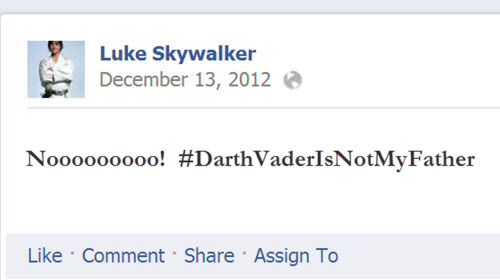 So how can use Facebook hashtags? Besides getting instant access to those on the scene sharing about an important news event or connecting with others watching a TV show or sporting event, you can use it in your business for things like lead generation. You can use hashtags to find people that are talking about the products or services you offer. For example, I regularly see people mention they’re looking for a virtual assistant. 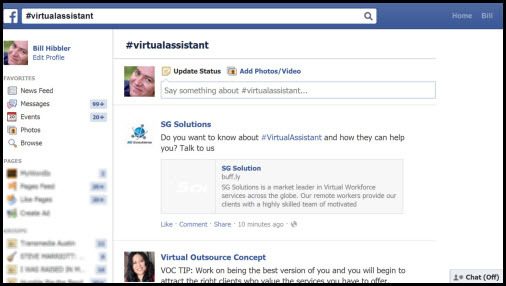 A virtual assistant that knows how to use the hashtag search feature can find potential clients by both using #virtual assistant in their posts as well as monitoring those mentions on Facebook. That way, they can find new people seeking virtual assistants and people seeking virtual assistants can also find them. If you’re posting on Facebook from Twitter or Instagram, your hashtag campaigns will work on Facebook. So no more having to create separate posts for Twitter and Facebook. Unfortunately, hashtags aren’t yet available on the mobile platform. So what do you think? Do you love hashtags? Hate them? Will you use them on Facebook? Type your answers in the comments section below. I wanted to add that, for the moment, it looks like hashtags posted in comments, while clickable, are not added to the hashtag pages. Only hashtags used in a post show up on the hashtag page.